It wasn’t your usual Friday afternoon in Caulfield’s Shop in Ballyhaunis last week. Proprietor Seamus Caulfield was inundated with customers popping in for news of the €500,000 National Lottery winner. 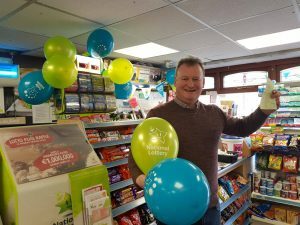 Mr Caulfield admitted that the return on the Lotto machine, which he installed three years ago, has been good, with customers appearing on RTE’s Winning Streak while a €50,000 scratch card was also sold in the shop. But now Seamus has a €500k Daily Millions prize to add to his own winning streak. Seamus Caulfield celebrates the win in store on Friday afternoon. The Daily Millions jackpot was won in Thursday’s 2pm game with Mr Caulfield receiving a call from the National Lottery headquarters in Dublin 45 minutes after the draw. The Ballyhaunis win comes only weeks after a Foxford player became a millionaire on the Daily Millions game while on March 8 last a €500,000 ticket was sold in Elphin in Co Roscommon. A spokesperson for the National Lottery said the Ballyhaunis winner has 90 days to collect their prize. Seamus Caulfield is the fourth generation of his family to run the convenience store. The busy premises dates back to the 1880s and is one of Ballyhaunis’ oldest. The doors are open before 7am every morning and don’t close until 10pm. “We’re one of the auld stock,” he said.